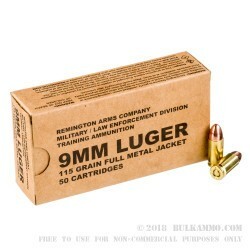 Stock up the right way with this 500-round case of 9mm Parabellum ammo from Remington. 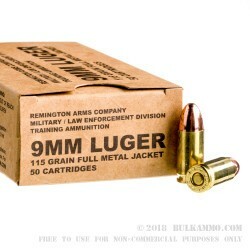 These lightweight FMJ (full metal jacket) loads are perfect for new shooters training at the target range as well as for experienced pistol-caliber carbine owners looking to climb the ranks in the new USPSA division. Remington, a well-known American outfit, is known for designing weapons and calibers that are in use around the entire world today. Their ammunition is manufactured in Arkansas on top notch machinery and then subjected to stringent inspection standards before being packaged up and shipped out. 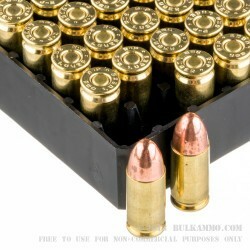 This load profile consists of a 115-grain bullet crimped into a reloadable brass casing with a non-corrosive Boxer primer at its base. The entire arrangement produces manageable recoil and a gently curved trajectory which easily matches most fixed sights.